I was wildly impressed with my lawn service. It was the first mow of the year and my yard looked like garbage beforehand. I anticipated I'd be spending a bunch of time this weekend finishing up, but this crew did an amazing job. Above and beyond. My Mom says the crew is doing a great job. They are great in doing what is asked of them. Polite and kind in asking for keys to unlock gate. They stack up wood neatly making it easier for my elderly Mom to place in trash can. As soon as grass goes dorment I would like to have crew come and bag leaves. Claude, really appreciate you coming out. Big improvement! Look forward to leaf removal and then getting the lawn back in shape. Thanks! We currently have no rainfall data available for Omaha, NE. Omaha is known for many things, including its gorgeous environment, and it’s also a great place to live. It’s also the place where you can make all of your lawn care dreams come true. Did you know that Omaha is home to one of the best lawn care services in the country—LawnStarter? Before you start thinking about your lawn care, you need to make time for all of the things that matter the most—how will you spend time with your family, and how will you choose to relax in this scenic city? Omaha offers dozens of things to do and see, providing recreational opportunities to a wide variety of interests and budgets. The Henry Doorly Zoo and Aquarium is a go-to spot for many locals, especially if you have kids. This dome contains dozens of species habitats, such as large indoor rainforest and even a special desert ecosystem. The Durham Museum is another educational must-see, offering historical exhibits within the unique setting of a 1931 train station. CoCo Key Water Resort, a huge indoor water park, is another fun spot that offers festive aquatic attractions year round. This park offers 40-foot slides, activity pools, indoor tubing, and even a water playground. Fun-Plex is open seasonally, but is another Omaha amusement park offering water rides, roller coasters, an arcade, and other family-friendly attractions. Make time to take a break and visit nature. The Fontenelle Forest is one of the city’s natural hubs, offering a museum, a rehabilitation center, and indoor and outdoor play areas. Lake Manawa is the closest lake to Omaha and offers campgrounds, hiking trails, and lakeside attractions like fishing and boating. Once you’ve settled on your weekend plans, make room in your schedule so that you can tackle everything you want to do, instead of your pesky lawn chores. LawnStarter is the premier landscaping service in Nebraska, offering a range of services including lawn mowing, tree trimming, and even flower care. We aren’t interested in wasting your time or money with one-size-fits all solutions. Instead, as the top Omaha lawn care service, we will work with you to develop a solution that is tailored to your lawn, your needs, and your budget. To get started, log on to the LawnStarter mobile app. From there, you can schedule, cancel, or modify any services you desire. We even handle special requests, so don’t be put off by thinking your task is too large, too small, or even too unique for us to handle. We can do it all! We want to make lawn care quick, easy, and affordable. Contact us today so that you can get back to enjoying everything Omaha has to offer. With Willms Lawn and Landscape, you’ll be taken care of! Each lawn is handled with care and each customer is left smiling! Recently partnered with LawnStarter, Willms Lawn and Landscape has been soaring in colors. Make them you’re next lawn care provider and you won’t be sorry! Korte Lawn Care offers a variety of lawn and landscape services for all your residential and commercial needs. We pride ourselves on our professionalism and quality of service. Services include lawn maintenance, fertilizer treatments, and irrigation systems. With us, you can rest assured your lawn is in good hands. If you want the most unique lawn in your neighborhood, Authentic Lawn Care is the way to go! We go the extra mile to make sure each lawn we groom has a brand new twist while remaining classic. Book with us today to have a lawn that shines! Excellent job. Send him to me all the time. What can I say, Eugene communicated proactively, let me know ahead of time when he was coming, and was on time. He mowed my fairly good size lawn, front and back yard with detail and in record time. I highly recommend him and will definitely be using him in the future. Thanks Eugene! Lawn looks great as always. And I appreciate the extra special care that's been taken on it. Andrew does an awesome job. Everybody that sees it comments on what a good job is being done on it. The lawn looks great! Haven't check yet if you guys came back like you said to trim out the bushes you'd missed on a previous service. Jose's Lawn & Landscape Inc. Above and beyond--he did an amazing job! I was VERY impressed that Ramon came by when my mowing was scheduled and decided that it was too soon to mow, saving me money for a service I didn't yet need. He re-scheduled it on his own and when he came back, he did a great job. No service has ever done that for me before and I truly appreciate it! I want him to pay closer attention to the area in each side of my storage building and to blow the patio off. My lawn looks amazing!! Thank you!! We can see the tougher spots of our yard are often skipped. As always, great job! The grass looks so green, even after the snow. Terrence did another great job! Pleased yet again! Looks nice again. Thank you! Awesome job, thanks for keeping the pool clean! LawnStarter pros will let you know what your lawn needs. 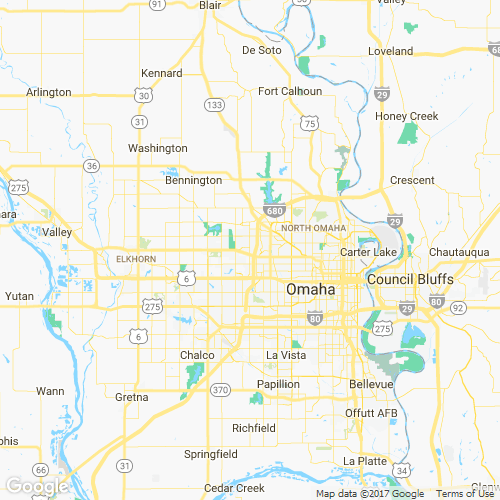 Here are some recent recommendations for extra lawn services in Omaha, NE. Description: Front yard, Right side Pick up leaves from right side neighbors property and dispose. Description: Front yard I would mulch around the trees in the front yard to promote a distinguished line and promote health. Items Needing Service: Received the quote - request service. Requesting leaf removal and mow tomorrow Tuesday, 12-19-2017. Location on Property: Front and back yards. Work to be Done: Bagged. Location on Property: Front, left side, and back. Are there watering restrictions in Omaha, NE? Does Omaha, NE have long / overgrown grass ordinances? We have no records of city or county-mandated long grass ordinances in Omaha, NE. However, 34% of customers in Omaha report having overgrown grass restrictions mandated by their Homeowners association. Garcia's lawn service is AMAZING! I have a large yard, and it was overgrown and covered in leaves front and back...they returned my lawn back to its former glory. A+++! #6-Jose's Lawn & Landscape Inc.